I remember when I was in college every month we'd have a LAN party and for the most part we'd play Defense of the Ancients, and I hated it. Well I didn't hate it per se, I just didn't find it as engrossing as other people did, but appearently other people do find it, and other multiplayer online battle arenas very appealing seeing as League of Legends, Heroes of Newerth and now Defense of the Ancients 2, are some of the most played games online right now. And they're all essentially the same game. Again I'm not the biggest fan of these games, so I welcome your comments telling me just how wrong I am, but I digress. 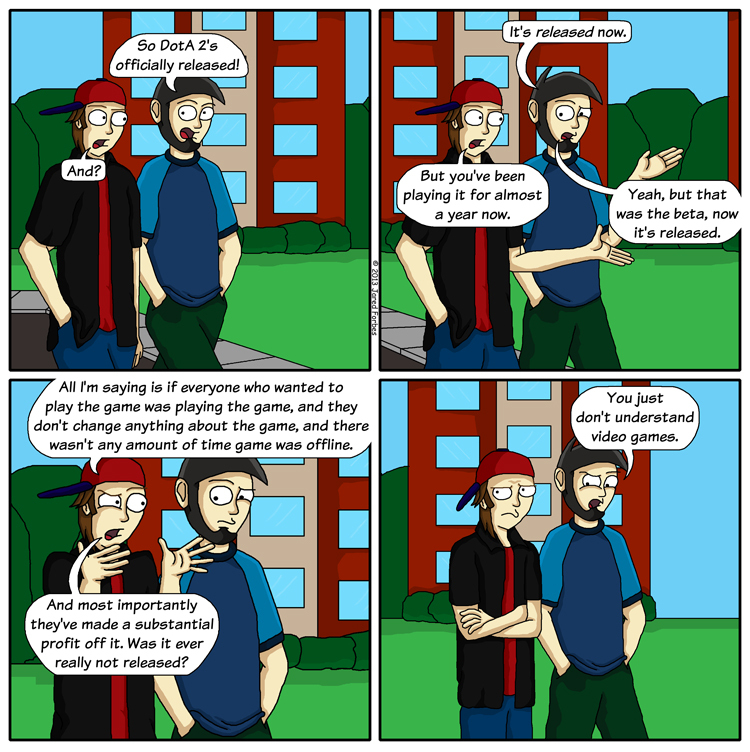 The real crux of this comic is the fact that some games now a days seem to have a rather lengthy beta periods in which the game is in essense complete. DotA 2 was in "closed" beta for quite some time, and yes it was closed beta in that you needed an invite to join the beta, but pretty much if you wanted an invite you could get one. Being an avid World of Warcraft player I was asked if I wanted an invite on practically a weekly basis, but even that isn't the issue. Valve has monitized DotA 2 in the same way they monitized Team Fortress 2, with vanity items paid for with real money, and in game chests that can only be opened with keys you pay real money for. I just find it a little weird that companies are making a profit on game still in beta, it just seems counterintuitive to be charged to pay an unfinished product. Needless to say, like Team Fortress 2 this have proven very lucrative for Valve. Then there's the eSports angle to the game, the game is still "in beta" and thus "not finished," but thousands of dollars are being played over in world wide events? So given all of that did anything really change on the 9th when the game was "released," other than the fact that the already previously mentioned flimsy barrier of entry the invite was.